Sri City, September 4, 2016:- Mr. Dharmendra Pradhan, Union Minister of State (independent charge) for Petroleum& Natural Gas visited Sri City on Sunday. Mr. V. Varaprasad, member of parliament, Tirupati accompanied the minister. On their arrival at the Sri City helipad, the minister and the MP were accorded a warm welcome by Mr. S.K. Samal, ITS, Development Commissioner, Sri City SEZ and Mr. Ravindra Sannareddy, Founder Managing Director. Mr. Samal briefed the minister on performance of different units in the SEZ, exports & imports details since inception, employment generated, investments made and highlighted the clean & green initiative in the SEZ and its implementation. Mr. Ravindra Sannareddy gave a brief presentation on the industrial progress and the infrastructural facilities at Sri City. Mentioning that Sri city is a happening place for national economy, Mr. Pradhan assured government’s help to the units. 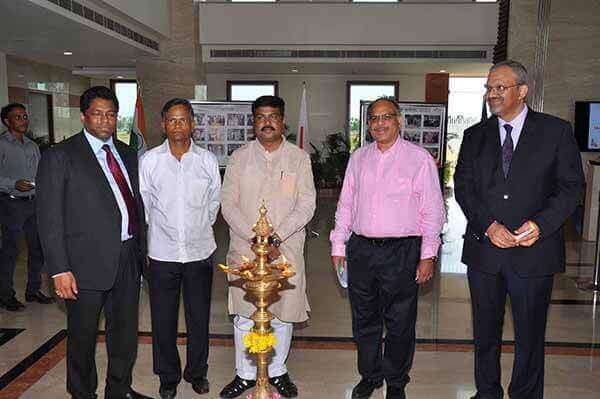 Mr. Dharmendra Pradhan went round the SEZ. He visited the production units of Rockworth, IMI/CCI, Everton Tea and Isuzu, and witnessed works in progress. He had an interactive meeting with the heads of the major industrial units.